Donald Trump dreams of a militarized border, with military forces to protect the 1.6 billion dollars that Congress has allocated for the creation of his "masterpiece". Despite signing a memorandum for the deployment of troops along the Mexican border, this will not happen, at least, in California and who knows in other states too, since the president must have approval from Congress and the governors of the Border States to have the authorization to post the soldiers. According to the Posse Comitatus Act, which was passed after the Civil War, the deployment of federal troops on US soil is prohibited and prohibits their use to enforce national laws. Several of the existing laws in the United States that legally blockade the exercise of certain presidential designs exasperates Donald Trump frequently. The president has not been careful to criticize US laws that allow people to approach the border and seek asylum. According to Trump, anti-immigration laws are weak. In fact, he did not hesitate to self-criticize his nation during the meeting with the Baltic countries when commenting: "We have horrible, horrible and very insecure laws in the United States." His concern became greater when he received reports from the caravan of migrants traveling through Mexico in search of asylum. Since then, the executive has endeavored to change immigration laws. In 2006, then-President George W. Bush sent about 6,000 National Guard troops to the border region in support of the Border Patrol. However, due to the laws, they could not arrest anyone, since they were not allowed to work as law enforcement agents. They had to serve by monitoring cameras, and building and repairing roads and fences. Everard Meade, director of the Trans-Border Institute of the University of San Diego, says that legally there are several resources that prohibit the president from militarizing the border limits. According to the professor, it is unlikely that the Armed Forces will submit to a trivial mission such as monitoring the border, although these are governed by the chains of command and must comply with orders. Some states have been reluctant to send their military forces to the border. Several of them have a very strong presence of emigrants and know what they mean regarding their internal economies. That is why many states like California have expressed a strong opposition to the anti-immigrant rhetoric that Donald Trump has had. Legally it is established that governors deploy the National Guard in case of emergencies and as support to other special forces of the country. Previous administrations were able to deploy the National Guard thanks to the approval of the Border States’ governors. It is also stipulated by law that the president may extend troops if there is an insurrection or invasion in US land. Meanwhile, Congress granted the possibility that the military to bring specialized equipment for certain operations, especially those related to anti-drug control. On the other hand, US president has considered several possibilities that allow him to carry out his mission to the south of his country. Official sources say that he will meet with Secretary of Defense James Mattis, to analyze all the options. 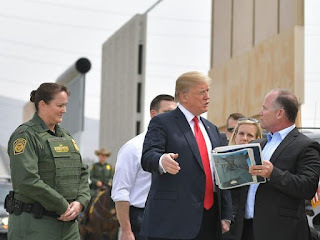 He has also questioned the security that exists at the border saying recently the Mexican border is much unprotected and emphasized the lack of hard laws that would provide more support for his efforts to secure the boundaries between both countries.